From Dan Mohn Facebook 25 Nov 2017: In honor of my mother, Esther (Hall) Mohn Corrello's 90th birthday earlier this week, I am posting this photo of her and her siblings, taken at the homeplace on the head of Thornton Creek abt 1937-38. Front row, L-R: Edwin Hearld "Edd" Hall (1922-2006); my mother Esther (1927- ); Alpha Levernia Hall Day (1925- ); Opal Clarice Hall Holbrook (1919-2012); BACK ROW, L_R: Sarah Evelyn Hall Holbrook (1915-1989): Harve L. Hall (1913-1996); Lula Beatrice "Bea" Hall Nelson (1910-1995); James Floyd Hall (1908-1975). Not shown was the firstborn, Joseph E. Hall (1906-1907) who died as an infant. They were the children of Alvin Hall (1887-1974) and Mary Franklin Hall (1884-1989), who lived their latter years (from the 1950s on until they had to break up houskeeping) on Crafts Colly. 3. Lula Beatrice Hall b 29 Sept 1910 d 22 Dec 1995; buried Georgetown Cemetery, Georgetown, Scott Co KY; m. George Nelson b 26 Mar 1899 d 2 Jan 1987; buried Georgetown Cemetery, Georgetown, Scott Co KY.
5. Sarah Evelyn Hall b 22 May 1915 d 4 Mar 1989 buried Thornton Cemetery, Thornton, Letcher Co KY; m. Marvin Holbrook b 29 Aug 1911 d 25 Apr 1993; buried Thornton Cemetery, Thornton, Letcher Co KY.
6. Opal Clarice Hall b 15 Dec 1919 Letcher Co KY d 2 May 2012; buried Green Acres Cemetery, Whitesburg, Letcher Co KY; m. 4 Nov 1942 Columbia, Richland, SC to Robert Winton Holbrook b 14 Jun 1920 Farraday, Letcher Co KY d 4 Sept 2009 Whitesburg, Letcher Co KY of lung cancer; buried Green Acres Cemetery, Whitesburg, Letcher Co KY; s/o Abbott Holbrook and Clementine Tolliver. Alvin Hall Occupation (Source - Dan Mohn): farmer and coal miner Letcher Co KY; Note: Alvin Hall worked as a coal loader for Elkhorn Collieries Corporation until he was pinned under a slate fall on 2 November 1939. The accident occurred in a mine at Farraday, Letcher County, KY. His Workmen's Compensation Board claim indicated that, at the time of the accident, he was paid on a tonnage basis, and he had earned approximately $90 every two weeks for his labors prior to the accident. As a result of that accident, which severely broke his foot, ankle, and spine, he was awarded a worker's compensation settlement in the sum of $1,200 for his total disability. He was a member of the United Mine Workers Union, District 30, Local No. 5810. In the years following his disabling mine accident, he worked a farm, first at the family home at the head of Thornton Creek, and then at his last residence on Craft's Colly. 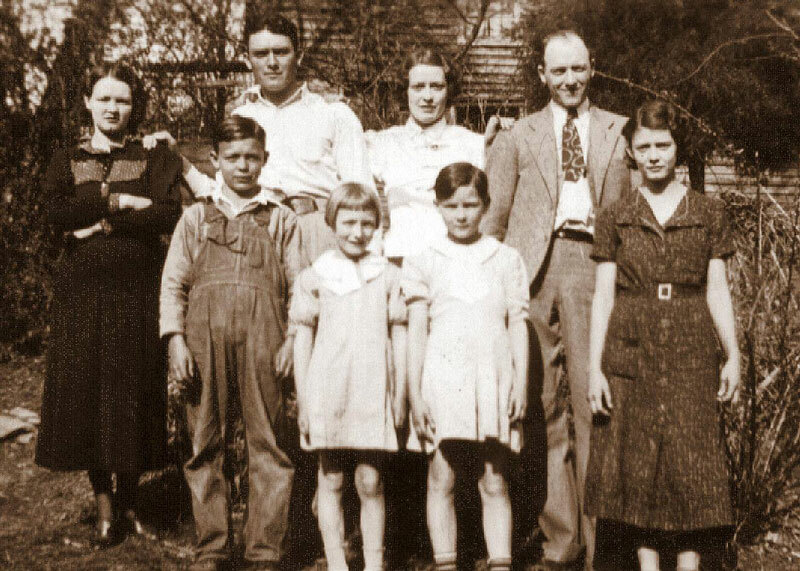 In December 1942 (during the Second World War), he and Mary were presented a Certificate of Achievement in the "Live-At-Home Program" of the University of Kentucky Agricultural Extension Service, for producing 75% of the food needed by the family during 1942.